Description: This dataset was measured in a five-day field campaign in May 2017 in Karlsruhe, Germany. An undisturbed soil sample is the centerpiece of the measurement setup. The soil sample consists of bare soil without any vegetation and was taken in the area near Waldbronn, Germany. M. Weinmann, B. Jutzi, and C. Mallet (2014): Semantic 3D scene interpretation: a framework combining optimal neighborhood size selection with relevant features. In: K. Schindler and N. Paparoditis (Eds. ), ISPRS Technical Commission III Symposium. ISPRS Annals of the Photogrammetry, Remote Sensing and Spatial Information Sciences, Vol. II-3, pp. 181-188. PCV 2014 Best Paper Honorable Mention. M. Weinmann, S. Urban, S. Hinz, B. Jutzi, and C. Mallet (2015): Distinctive 2D and 3D features for automated large-scale scene analysis in urban areas. Computers & Graphics, Vol. 49, pp. 47-57. This data set contains fisheye images of a checkerboard recorded with different lenses and sensors. The dataset for the EnMAP Contest originates from the simulated EnMAP Alpine Foreland image covering the area around the Ammersee in Bavaria, Germany. Based on the original dataset, 20 different land use classes have been defined on the screen by focussing on visual differences in the images (considering several channel combinations) but also by checking pixels’ individual spectra. Evaluation: The evaluation procedure will be similar to the ones of the Middlebury Stereo Vision benchmark, the ISPRS Test Project on Urban Classification, 3D Building Reconstruction and Semantic Labeling and the IQmulus & TerraMobilita Contest, i.e. if you are interested in participating, please submit the achieved quality measures and the classified image. After submitting these data, your results will be evaluated and you can request that your results are added to the permanent table. For the latter, it is mandatory to provide (1) a short description of the algorithm or the reference to a paper where this algorithm has been published and (2) respective code fragments or hints on the involved software packages. This is an add-on to the online available omnidirectional camera calibration toolbox OCamCalib of Scaramuzza et al. The 3 image data sets necessary to run all test calibrations can be found below. Please consult the readme.txt on how to install the add-on. If you make use of our extended version, please cite the corresponding paper. Publication: Urban, S.; Leitloff, J.; Hinz, S. (2015): Improved Wide-Angle, Fisheye and Omnidirectional Camera Calibration. ISPRS Journal of Photogrammetry and Remote Sensing 108, 72-79. The following data set comprises aerial image sequences and a xml files with manually labeled trajectories of all visible vehicles. If you use the data, please refer to this web page or to the KIT AIS Data Set. Many thanks to the German Aerospace Center for providing the aerial image sequences. The following datasets have been created for the research project VABENE - People Traing in Aerial Image Sequences. Each dataset comprises of an aerial image sequence and a xml file with manually labeled trajectories of all visible persons. We provide test data for applying Simultaneous Localization and Mapping (SLAM) algorithms. The Laserscanner Multi-Fisheye Camera Dataset (LaFiDa) includes fully synchronized laserscanner data and image sequences for three diverge fisheye cameras, aswell as ground truth trajectory. LaFiDa is supported by master students of Geodesy and Geoinformatics at KIT during a student project in "Project Computer Vision". Note: LaFida is currently in a release candidate state. The use of LaFiDa is for free, but please refer to the publication below. Source: click here for further information. MLPnP offers the possibility to integrate observation uncertainty into the direct solution of the PnP problem. This is especially useful if an estimate of the observation covariance is available. Given that estimate MLPnP outperforms the given state-of-the-art PnP solutions (see Figure on the right). If equal observation uncertainty is assumed MLPnP still outperforms the best polynomial solvers in terms of speed and accuracy. The C++ version of MLPnP is integrated in a fork of OpenGV. You can find the link to the fork below. In addition we provide Matlab Code which is slower, but produces the same results. The toolbox provides all PnP solvers in a Matlab toolbox to reproduce the results presented in the paper. MultiCol-SLAM is a full multi-fisheye camera SLAM system build upon ORB-SLAM. It extends ORB-SLAM with some novel concepts and methods. First, keyframes are exchanged by multi-keyframes modelling the fact, that multiple images exist at each keyframe position. 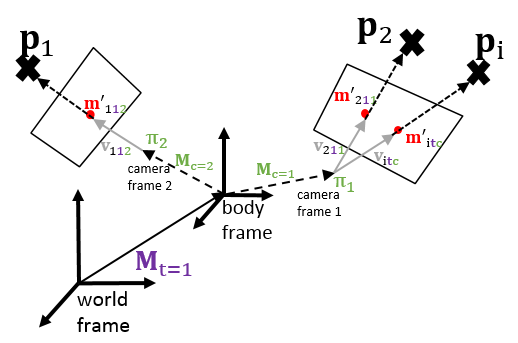 The multi-camera system is modeled using MultiCol and the camera projections within these model are calibrated using a generic polynomial model. Bundle adjustment is formulated as an optimization of a hyper graph and implemented in g2o. Furthermore, new types of descriptors are included, i.e. a distorted and an online learned, masked version of BRIEF. The loop closing mechanisms and re-localization capabilites of ORB-SLAM are extended for multi-camera systems. Publication: Urban, S.; Wursthorn, S.; Leitloff, J.; Hinz, S. (2016): MultiCol Bundle Adjustment: A Generic Method for Pose Estimation, Simultaneous Self-Calibration and Reconstruction for Arbitrary Multi-Camera Systems./ International Journal of Computer Vision (IJCV), pages 1-19, 2016. The dataset ehist.txt is a random sample taken from 'dead' building insurance files recording the history of insurance-relevant events occurring to insured buildings in Baden (Germany) between 1936 and 1993. A 'dead' file corresponds to addresses whose buildings were no longer insured under that address, e.g. because of demolition or property splitting. The three datasets dfnobmfe.sp, dfnobmfe.tse, dfnobmf.tse contain the building histories from the random sample taken from the dead files. The first dataset dfnobmfe.sp is in SPELL-format, where each spell begins with the year in column "from" and ends in the year in column "to". The state can be any other column. is recorded in column "EK".